In September 2012 Merck filed Suvorexant with the FDA and began the process of creating an unbranded campaign. My team worked with Merck to distill insights and produce concepts for primary research. These concepts were tested along with work that was produced by JUICE. The client was confident that our team could use the branded brief to create the unbranded work. They also wanted to use the same concept for both HCP and HCC communications. Prior messaging research had given us a very small area to work in, and this area did not have a strong RTB. In order to open the creative opportunities, bring in work we believed in and be successful, we had to present a strong argument to convince the client to change messaging priorities. We used a process I developed that took all the existing consumer interviews and categorized them into Creative Pathways. We searched for patterns in consumer responses, and distilled them as meta-insights. This tool was used in conjunction with the client brief. Our work was presented in a carefully crafted presentation that worked within the framework of the clients existing belief system. People have many questions but few answers when it comes to insomnia. 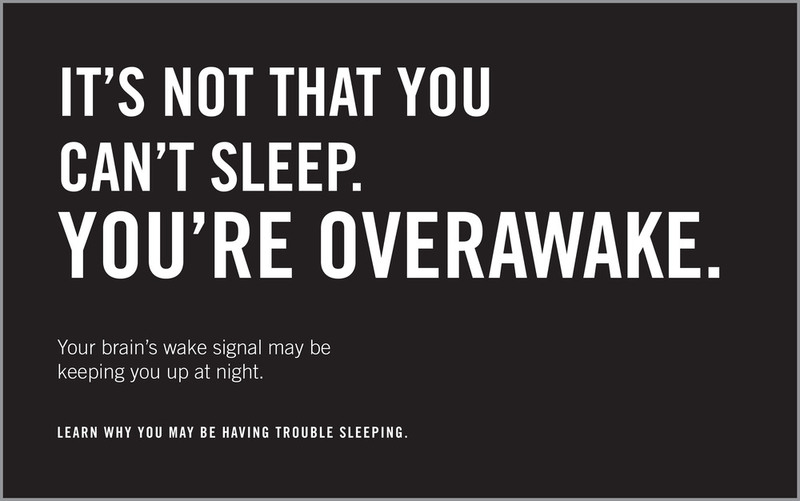 Over-Awake is new phraseology used to explain the problem behind their insomnia. 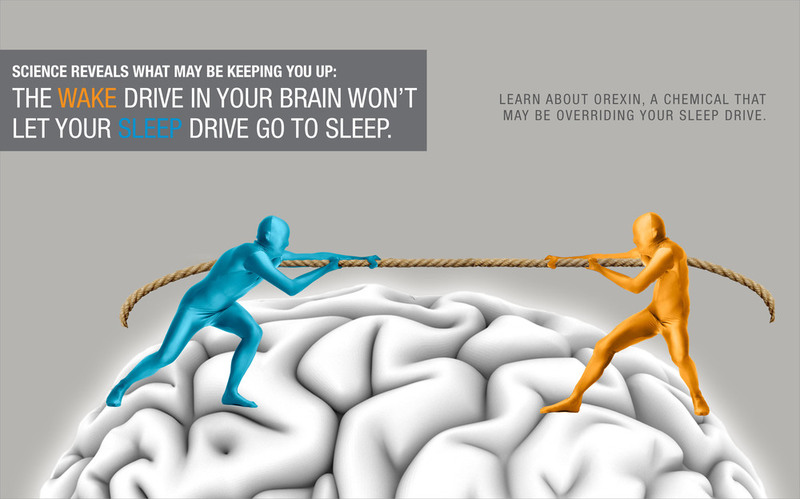 Normal sleep occurs when the brain naturally quiets down the wake-drive, and lets sleep take over. 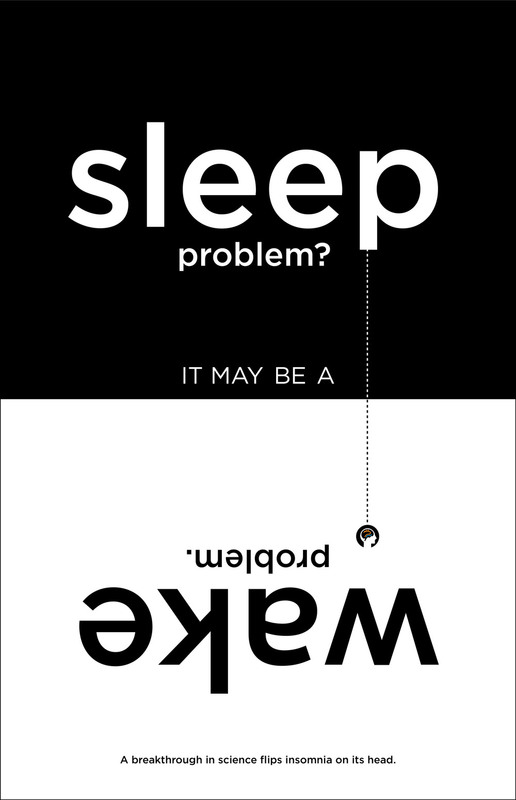 The inability to sleep (insomnia) may occur when your wake-drive overrides your sleep-drive. In the wake-sleep region of the brain, there is a brain chemical that may be keeping you up at night - It’s called Orexin. When Orexin promotes wakefulness at the wrong time (at night), you may have difficulty falling and staying asleep. Our creative teams were able to use this more specific direction to hone in the work. We also used it to illustrate the rationale behind all the concepts. Our clients were convinced that the "Wake-drive + Sleep-drive" story was the strongest messaging. We believed that "Orexin" had more impact and differentiated the science behind Suvorexant. While we delivered on what was asked, we also presented alternate headlines or secondary copy that focused on Orexins. 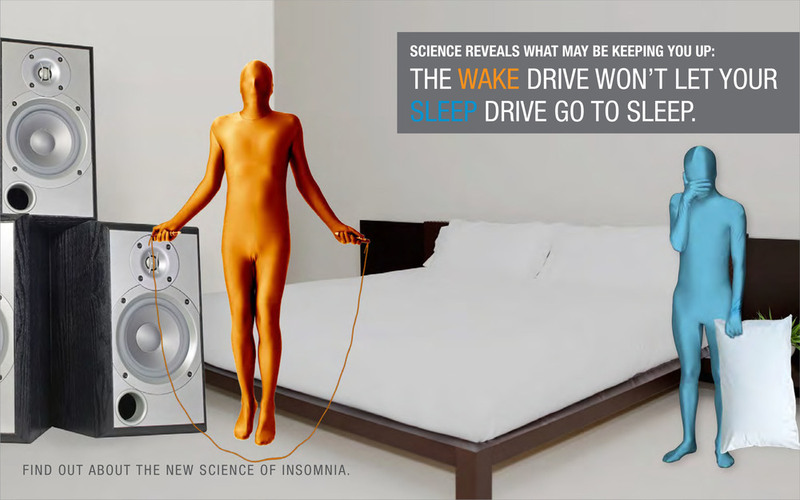 On the first day of research it became clear that the "Wake drive + Sleep drive" messaging was causing confusion. We recommended using our alternate copy, and using different messaging in each concept to push them apart from comprehension standpoint. Our researchers recommended adding orexins to all the concepts, but trying to keep the concepts as close to the originals as possible. All the concepts tested better the next day. We then adjusted the concepts for the third day, this time with a clearly different message for each concept. The visual and headline referencing the clock communicate a highly familiar and emotional scenario, establishing immediate engagement. The orexin reference implies there is something new. The concept overall has a feeling of hope – it makes patients feel like they will get an answer, and it gives them the key (i.e., orexin) to go look for it. While the visual of the neon lights overlapping is attention getting and tells part of the story (i.e., the intertwined relationship between wake and sleep), many don’t understand from the visual that wake is overpowering the sleep and that this is news. The orexin reference and the brain visuals indicate the physical nature of the problem, which is new and relevant. The visual of the light on and the simple question in the headline incites familiarity and captures the loneliness and isolation that many insomniacs face. The orexin chemical reference provides an element of news and a reason to believe that an answer exists. While some applaud the option for its minimal elements, a few do not find anything worth stopping for. While the visual and headline represent a very relevant feeling for respondents (i.e., a tug of war struggle between wake and sleep), many do not recognize anything new in the concept’s message. They appreciate the simple depiction of what physically causes insomnia, but most do not see anything newsworthy in the message and are, therefore, not motivated to take any specific action. While some appreciate the new lens this concept puts on their insomnia (i.e., looking at it from the wake perspective), others do not recognize anything new in the message outside of the new and “awkward” term, “overawake.” When the concept references orexin, it performs well because it implies a more tangible sense of news. Without orexin, the credibility and newsworthiness of the concept falls short. The client chose to not run the unbranded campaign to avoid friction with the FDA. The ZOSTAVAX vaccine is for adults 50 years of age or older to prevent Shingles (also known as zoster). When concepts for the disease awareness campaign were first briefed, most within the target audience had incorrect notions of what Shingles was. Since the television campaign began running in 2013, awareness of the disease improved over 85%. Our job for this project was to create an online campaign that would test features of partner SAY MEDIA's advertising tools for possible long term engagements. The campaign had no particular outreach goals. The response was overwhelmingly positive and SAY MEDIA shared with us that the campaign had an unprecedented number of click-throughs.